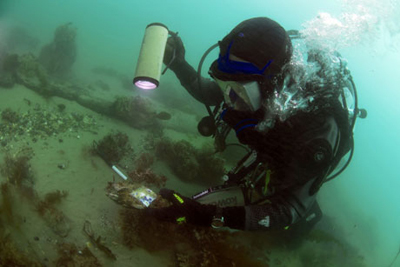 Archaelogical divers are to investigate an area off the Isles of Scilly where it’s believed Sir Walter Raleigh’s ‘lost ship’, The Flying Joan, sank in 1617. Last month, a piece of timber was retrieved, leading to speculation that it could be the remains of the vessel, which sank in a storm after it left Plymouth for Venezuela and the fabled treasures of El Dorado. The hunt is part of an English Heritage project to investigate 88 hitherto unrecorded, pre-1840 coastal shipwreck sites to determine which, if any, should be accorded protected status. They include a possible Tudor wreck on Walney Island, near Morecambe Bay, and a paddle steamer, The Forfarshire, which foundered off the Farne islands in 1838 and made a heroine out of lighthouse-keeper’s daughter Grace Darling. Although England is a seafaring nation and this month is the 40th anniversary of the Protection of Wrecks Act, maritime heritage has something of a Cinderella status-wreck sites pre-dating 1840 account for only 4% of the 37,000 known and dated sites, the majority being post-1914; only 47 historic boats and ships in England have statutory protection against unauthorised interference.